Mac Miller’s music has been a constant in my life since I was 13. I can remember pretending to know who he was at summer camp in the summer of 2010 to fit in with the cool kids and then anxiously downloading his mixtape when I got home. His first project, K.I.D.S., was the first mixtape I downloaded on the infamous hip-hop goldmine, Datpiff.com. I was instantly mesmerized by the frat boy raps, detailing the lavish life of skipping school to smoke weed and skate. His early projects remind me of the simple image of success that I had conceptualized as an adolescent, when my only concern was my newly formed collection of graphic t-shirts and my developing acne. This era of music is a bookmark in how my music taste developed, from the borderline demonic raps of Odd Future to the lean-heavy content of A$AP Rocky, the mixtape era was a definitive one for me and Mac Miller was the catalyst for that chapter. While Miller was the beginning of my modern-day music taste, he also delivered my first disappointment. I had been waiting for his debut-LP, Blue Slide Park, anxiously and borderline obsessively. I would refresh the iTunes Store everyday, before the days of Twitter and Reddit, stalking and waiting for this record to drop. Finally, on November 8th, 2011 the record dropped. This album was the first time in my music fan-hood that I was thoroughly left dissatisfied. I found the production to be lackluster and the content to be daft and dull. Though now I believe I was being a little harsh on Miller I still contest that this album is his worst and was a deafening misuse of his talent and charisma. At the time I speculated that this was the end of the road of my fandom of Mac Miller, which was obviously a incorrect assertion as time would tell. 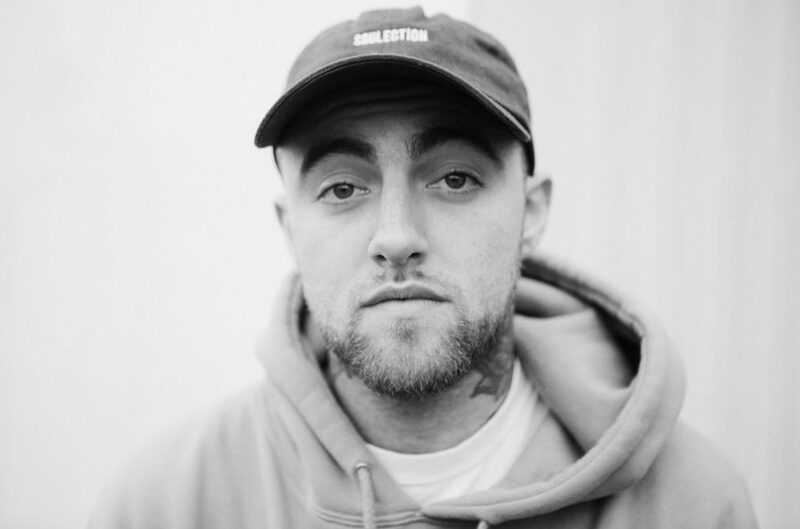 Following the release of Blue Slide Park, Miller started on his journey of musical discovery with the experimental mixtape, Macadelic. This was the start of the most transformative career in hip-hop history. This mixtape dealt with the beginnings of his drug abuse and depressive symptoms, yet since he was still an emerging act it did not garner much mainstream attention. In the world’s eyes, he was still adolescent phenom Mac Miller. Like much of his discography, it seemed like people weren’t looking out for signs rather just skimming through his music. Subsequently, Miller would release a slew of projects which were surrounded by the troubling themes that would eventually be the central theme of his stardom: his drug habit and deteriorating mental health. 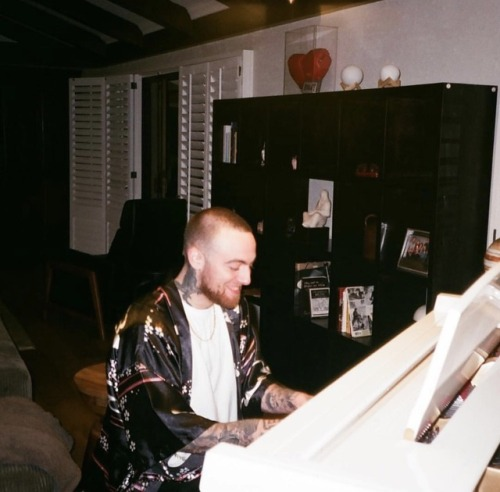 From FACES, a project mostly dealing with his own death and drug use, to GO:OD AM, a conceptual album about his necessary “wake up call” in his own personal life, it was obvious that Miller was losing a battle within himself. There are few thematic concepts more soul-crushing than watching someone explicitly predict their death and it come true in horrific detail. It was not until his record, Divine Feminine, that we saw a glimpse of light in Miller. The record was the most positive music he had made since the K.I.D.S. era, seeing as though in the eye of the public Miller was in the most positive position he had ever been in his adult life. He had managed to maintain a position of mainstream success and had a publicly successful and fruitful relationship with pop star Ariana Grande. On the outside, it looked like we were finally seeing the breakthrough that Miller’s fans, friends, and family had been dreaming for since he revealed his internal and external struggles. This bliss and hope for Miller in the public spotlight was unfortunately short lived. His relationship with Grande would have a private falling out, with both parties saying nothing but positive statements about each other following the split. The only glass with which we had to look at Miller’s mental state were headlines and lyrics, and both were dark and daunting. Months before his death, he had been pulled over for a hit and run, to which he was also charged with a DUI. Following this arrest, Miller assured the public he was okay and had his recreational drug and alcohol use in check, which was a reassuring, yet obviously a false narrative. One of the more depressing aspects of the tale of Mac Miller is this notion that because of his outwardly normative persona that he was okay. Personally, that is one of the more relatable aspects of Miller. He spoke to a whole demographic of deeply troubled millennials whose only outlets are music, recreational activities, and solitude. He was the voice of depressed extroverts everywhere and he was the model citizen for those who can maintain an active and engaging outward appearance while battling internal sorrow and emptiness. I always looked at him like a superhero, in a cinematic way, like no matter what he rapped about or the headlines that came out about him that he was invincible. Being an only child, Mac Miller was the big brother I always wanted. I never had anyone to show me interesting music or the cool tattoos they had, so I filled that void with Miller. I would obsessively watch his freestyles, interviews, and music videos. He filled the time I should have been studying with hours of soul-satisfying content to which I will forever be grateful. When he died, it was like the adolescent aspect of my music fanhood died with him. I will never feel the same way about another artist ever. It felt like I grew up next door to Mac Miller; his music made me feel like he was rapping to me on my couch after a party and he was so personable that it felt like we were life-long best friends. The way his story developed and his public persona always reassured me that no matter what we personally go through, eventually things will get better. When his untimely death arrived, that threw the notion of reassurance I previously stated out the window. There was nothing more depressing than watching my hero die fostering the internal demons, that he details so intently on Swimming, from which he saves me from everyday. That is why I listen to his music daily. My assertion is that since I could not see him reach a point in his life to where he was mentally content, that I should try to achieve that point for him, and if his music is the caravan to get me there then that is honoring his memory. I miss his presence on this earth constantly and I feel bereft of his persona in almost every avenue of my life. Hopefully, when I get more courage and see my parents less, I can finally get a tattoo to honor his memory. Known professionally as Mac Miller, Malcom James McCormick released his debut studio album back in 2011. Swimming was a released at such a turbulent time for music that most people glossed over it’s release. Coupled along with Travis Scott’s long awaited release of Astroworld overshadowing the album, Miller had avoided the spotlight expertly months before. There was little to no promotion for the album, with Miller only releasing a batch of noncommercial singles. Divine Feminine was almost 2 years old and he had not put out any music since then, so his public presence was extremely low-key at the time. This atmosphere only added to the independence of the record. It felt like not only was Mac Miller tired of stardom, but actively avoiding it. His only semi-radio friendly song was “Self Care”, and even that track is barely pop-centered. The record felt like it was made and specially tailored for his fans rather than for wide-spread acclaim. That is why it’s so fascinating that post-mortem Swimming is getting wide-spread acclaim; I hope that his situation highlights the idea that we should smell the flowers of someone’s creativity while they are still here to witness it. The record itself oozes of musical self growth. Mac Miller had the greatest musical transformation I had the pleasure of witnessing in hip-hop history, and this was just the cherry on top. You can hear the progression of his MC skills as well his production, with most of the beats on the album being handled by Miller himself. He was aided by Jon Brion, the famous composer and one of the creative minds behind the orchestral sound of Kanye West’s critically acclaimed sophomore album, Late Registration. This instrumentation delivered cinematic elements to the record that added to the ever present creativity of Miller. It was another level of the presentation of Mac Miller’s talents and showed the blossoming of his career. 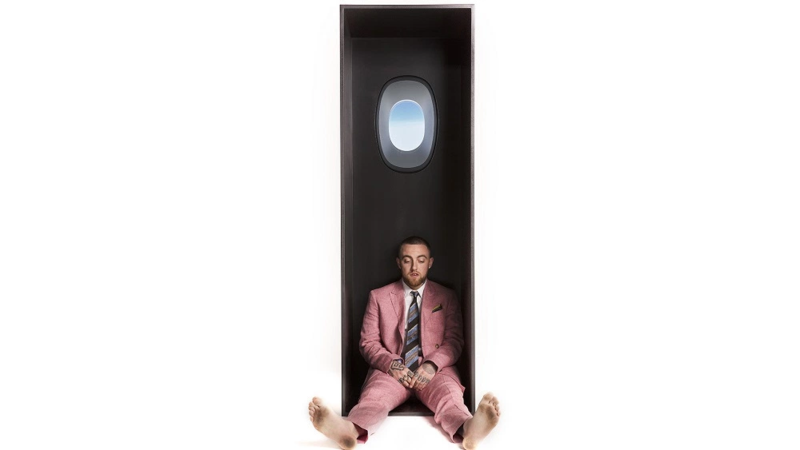 Through the numbing lyrics and lively production, Mac Miller takes into the depths of his personal hell, detailing the pool of insecurities, darkness, and opioids in which he was drowning in. The theme of the album, in my perception, is trials and tribulations of those who fight off plights of existence on a semi-regular basis. This record played like we were falling into the existential abyss with Miller, anxiously gripping onto a vine of positivity, with little to no avail. Though the production is upbeat and beautiful and the hooks naturally catchy, the serotonin snatching somber sentiments of Miller echo from start to finish on Swimming. I perceive albums as snapshots of an artist’s life at the time, and Swimming seemed like the curtain call for Miller’s sanity. Unlike on records like FACES and Watching Movies With The Sound Off, the depressive symptoms weren’t screaming in your face. On Swimming, the anxieties and hopelessness are wrapped in a blanket of beautiful violins and slick metaphors, almost distracting you from this musical counseling session being manifested. With a careful ear, one could understand the hopelessness in his lyrics, which reign haunting with the untimely death of Miller on September 7th of this year. I wonder if his death has made my view of this record jaded. It seemed like Miller was hoping for the redemption he deserved, like he had been sitting, sulking in his deep thoughts, and that he was preparing for a ray of sunshine to enter his life. It makes me physically sick to think that he never was able to feel the warmth he so plentifully deserved. This idea is why I listen to the record obsessively, I hope to feel the U.V. rays of normalcy that Miller was practically begging for on Swimming. A fascinating aspect of this record is its metamorphic qualities. It has the ability to make me feel nothing and everything simultaneously. When I am in the depths of personal turmoil, I find this record to be a calming ocean of understanding in a way no person can truly deliver for me. At times when my mood is uplifted and positive, I find myself appreciating the musicality of the record and Miller’s ability to pen a picture that most cannot fathom. It truly is so transformative that I find myself listening to it at all times in the day. This is the reason this is my favorite record of the year. I want to say it’s objective and has little to do with his death, but that’s not true. His death made the weight of his statements on Swimming too dense to float. Rap music is so performative that it was uncomfortably sobering to see someone so entrapped in the personal hell they detailed on their record that it resulted in death. The aspect of “swimming” is a constant theme throughout the entire record. He details this sentiment of drowning and swimming on almost every record, hence the name of the album. My favorite instance was pointed out on the record “Jet Fuel”, on which he states, “Now my head underwater/But I ain’t in the shower and I ain’t getting baptized.” The use of swimming as a metaphor for his mental state is so beautiful and emotive that it has permanently pressed in the way I categorize my own mental state. The theme entails that there are times when you are hopeless and you’re trapped by your own thoughts, hence the drowning metaphor, but at others you can weather the storm and swim through existence. This idea is what leaves me with such a divisive interpretation of the record. It is haunting and hopeless, but that is partly due to the death of Miller. The fact that this snapshot detailed his last months on this Earth is what leaves it weighing heavy on my heart. I have not connected with a record like this since Blonde by Frank Ocean came out. This record is so outwardly honest and expressive that it reminds me of the music that brought me into the musical place I am today, which ironically was Mac Miller. My attachment to this record will never fade, as my fanhood of Miller. The sentiments on the record leave me surprisingly hopeful. The tide of life does drown us at times, yet that only makes us appreciate the times when our head is above water endlessly. The only thing I can hope is to keep swimming.